The way that personal injury lawsuits are typically settled involves a monetary award given to the injured person by the liable party (and his or her liability insurer). This is what is referred to as damage awards. The highest median damage award for personal injury lawsuits is medical malpractice ($600,000), and the second highest is product liability ($300,000). There are a number of different things that fall into the damage awards category, but here are the three most common. One of the most obvious personal injury damages that people are compensated for is the cost of medical treatment. 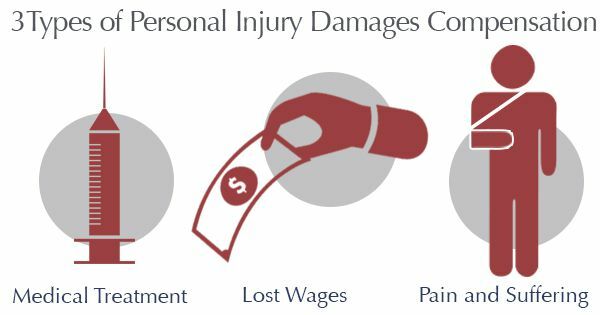 There are over 31 million serious injuries in the United States every year, and in cases of personal injury, it is not up to the injured party to pay them. Medical bills can pile up quickly, and are usually expensive. The damage award will usually include reimbursement for medical bills that have already been paid and for any anticipated medical treatment that the injured person may need in the future. If an injury is severe enough to put a person out of work, he or she may also be compensated for lost wages. This includes the wages lost at the time of the injury and during the period of recovery, as well as any wages that the injured person will lose in the future because of the injury. This is usually referred to as personal injury damages for loss of earning capacity. One of the main personal injury damages that people receive compensation for is pain and suffering. This can be difficult to quantify because there is not some objective scale for pain or suffering, and each case and injured person is different. This is also further complicated by the fact that “pain and suffering” refers to both physical and mental well-being. Usually the way pain and suffering is calculated is using what is called a multiplier. This is generally somewhere between one and a half and four, and is multiplied by the dollar amount of lost wages and medical bills combined. Personal injury damages are usually negotiated between the insurance company and the defendant, and the injured and his or her lawyer. These negotiations can be tricky and complicated, but qualified personal injury attorneys will be able to negotiate for the injured (as well as provide counsel and representation).